Sign up for a 15-day free trial to watch this season. In Season 1, Jani will guide us through four abdominal and four ujjayi breathing techniques, demonstrating how each applies to the asana practice. These pranayama practices can be done on their own or within the asana practice. 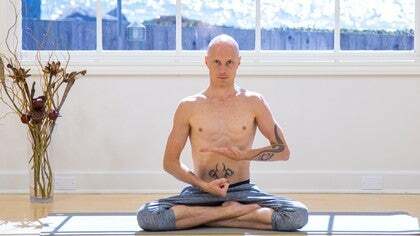 Jani welcomes us to the first season of his show Practice with Jani, where he will share eight pranayama practices to help connect mind and body. Jani introduces us to the different types of pranayama practices that we will be exploring this season. Jani guides us through a tutorial on Purna Ha Jathara Bhedana—full passive abdominal breathing. Jani guides us through a tutorial exploring a passive and expansive abdominal breathing technique that works well with inversions like Shoulderstand. Jani guides us in this pranayama tutorial of Ardha Ha Jathara Bhedana—an active abdominal breathing practice that works well in forward folds. Jani guides us through a pranayama tutorial of Purna Ha—full active or compressive abdominal breathing. Jani offers a detailed summary of the four abdominal breathing practices we've practiced thus far during this season. Jani introduces us to the four ujjayi breathing practices that he will offer this season. Jani guides us through a tutorial of Vishuddi Vakya: Throat Ujayyi. This pranayama can be practiced on its own or in an asana practice. Jani guides us through a tutorial on Anahata Ujjayi to find vibration and resonation in the heart center. Jani guides us in a tutorial on Manipura Ujjayi, focusing the energy vibration on the navel center. Jani guides us in a ujjayi pranayama tutorial of the "Great Sound" or Mahavakya Ujjayi. Jani reviews all that we have covered this season including the four abdominal breathing practices and the four ujjayi practices.